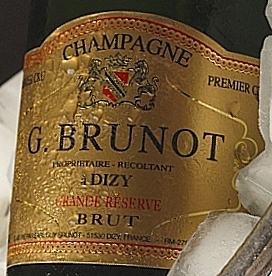 You are on the website of Champagne Guy Brunot, a family-run Champagne house in Dizy. Dizy is a charming little village, just 3 km away from Epernay in the heart of the Champagne region. The bottling 2008 is available ! Blend of the three grape varieties which matured ten years in contact with the yeast in our cellars. This long maturation gives the champagne a very smooth and round taste. It develops aromas of candied fruits and light honey flavours. Due to its long maturation it is a very rare Champagne and we produce only 300 bottles per year. A special product for a special moment. Each cap (muselet) is numbered and therefore unique (one colour per year). Reserve your bottles, the quantity is limited to 300 pieces only!